The law office of Wellman & White, PLLC released a rockfish as part of The Roanoke Valley Rocks campaign. 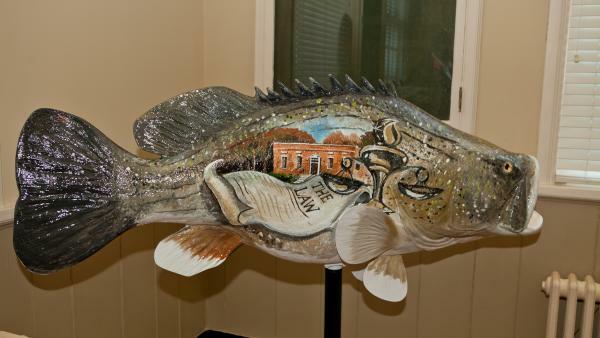 The fish, painted by local artist Napolean Hill, features the law office building, scales of justice and a legal document. The fish is located comfortably in the lobby of the law office. Wellman & White, PLLC has served the legal needs of the Roanoke Valley for over 60 years. Attorneys Thomas Wellman, William White, Jr. and Holly Wilson are committed to providing quality legal services to clients and maintaining a tradition of service to their clients, the community and the profession. The attorneys and staff work closely with clients in an effort to assist them promptly and efficiently. The practice is concentrated in areas that best serve the needs of clients and the growing community, including business law, residential and commercial real estate, estate planning and administration, and municipal law. Wellman, White & Wilson, PLLC traces its history to two of the area’s oldest former law firms. The firm’s attorneys have practiced with two former Resident Superior Court Judges and a current District Court Judge. Members of the firm have served and continue to serve in leadership positions with the North Carolina Bar Association and the Halifax County Bar Association. They also hold the key leadership positions in the community. The law office was constructed in the 1930’s as the Roanoke Rapids Post Office. The building has been adapted to its current use while maintaining its original architectural integrity and beauty. The building provides an accessible, comfortable and welcoming office for clients, as well as a pleasant place to work.